Tiffany Muston had a dream that began in early childhood. She wanted to be a Cinderella bride. 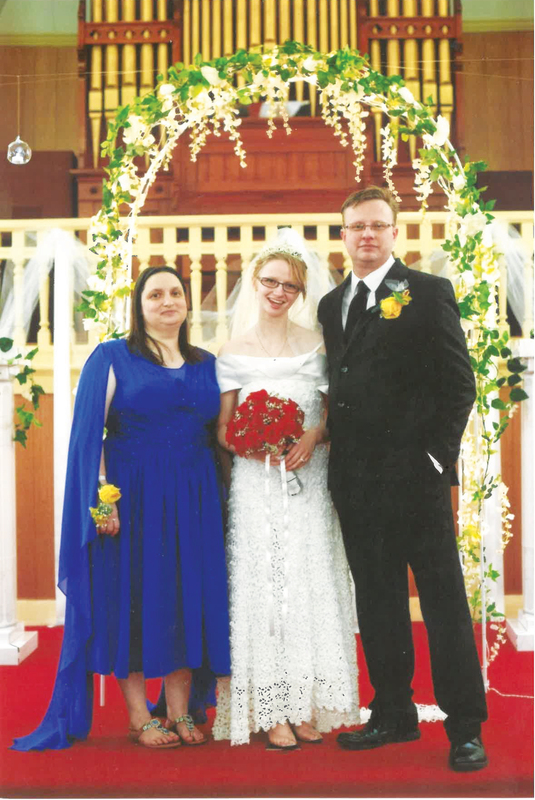 Muston and her mother, April Carlson of Gowen, made this dream come to fruition when Muston married her husband Alex in February. Carlson is a crafting and artistic queen. She is self-taught in multiple disciplines including piano, cello, sewing and crocheting. Her limitless imagination and creativity were successfully put to the test when helping her daughters (yes, plural) plan their weddings. Carlson is the mother of four — two daughters and two sons. It was always an agreement that Carlson and her husband would gift their daughters with weddings and both of their daughters got engaged. Being the creative woman she is, Carlson hoped to make her daughters’ wedding dresses. While her eldest daughter opted to buy her dress, Muston knew exactly what she wanted her mother to create. Muston originally planned to wed her fiance May 4 but a job opportunity for the couple pushed their wedding date up to Feb. 2. Carlson’s other daughter is getting married April 6, so she had to adjust her schedule to get Muston’s dress, flowers, decorations and food ready in a much shorter time frame. The most amazing part of this process is that a pattern didn’t exist for Muston’s dream dress. Carlson created a freestyle pattern, using the classic movie as a guide. She purchased spools of a thread that is similar to what is used to created doilies. With that, she crocheted together moffitts, which are small pieces that are eventually sewn together to create a larger piece. She experimented with moffitts in small, medium and larger sizes. 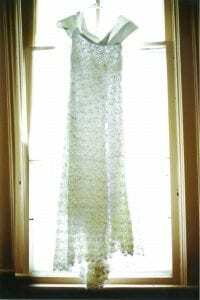 Muston preferred the smaller pattern her mother had crafted. Three months and 4 1/2 miles of thread later, and Carlson created her daughter’s dress without the use of a pattern. Carlson then purchased fabric to sew together the slip that served as a form underneath the moffitts. She used the same fabric to create the collar that Muston wanted to bring her vision to reality. By completion, Carlson had crocheted 4 1/2 miles of thread and spent a total of $45 and three months to make her daughter’s one-of-a-kind Cinderella dress. Carlson also used a metallic thread to create a train that could be buttoned to and removed from the back of the dress. Carlson and Muston’s ingenuity didn’t stop with the wedding dress but encompassed all of the wedding and reception. Carlson and her husband presented both of their daughters with a budget and explained that if they undertook some of the work, they would have more room to work. “I have all the big ideas and everyone else helps me carry them out,” Carlson added with a laugh. Muston shares her mother’s creativity and enjoyed the process of making the decorative items for her wedding. It was clear speaking with both women that this was a bonding experience for mother and daughter and bringing both families together prior to the wedding. Muston and Carlson both talked about how making everything come together was a team effort and it was a great way to break the ice between the two families and the bridal party. Because of this, both women said it helped keep the stress level low and it was an opportunity to make lasting memories and emphasized the importance of having fun. Along with a wedding dress, all of the flowers, table settings and programs, Carlson and crew also made all of the food. This included a decorative and unique dessert as well; Jell-O cakes. In some references, these are also called Raindrop cakes and it involves making a clear gelatin mold that has been flavored which is then injected with colored gelatin to create a pattern. 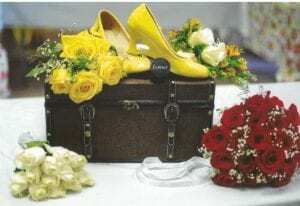 For Muston’s wedding, it was a flower. During all of this flurry of activity, the first of several winter storms hit the area and that meant a delay in the flower delivery. Carlson didn’t let this get to her and she called FedEx and learned that due to icy conditions, their delivery would not be on the planned day, which delayed creating the bouquets, corsages and boutonnieres. Flowers are live plants and as such, customers can go to the FedEx distribution center in Grand Rapids and pick up their items. This option is exclusive to medicine and live plants. How Carlson managed to create such a well-oiled machine is admirable. Decorating for the reception had to be done the day of the event and she found a system that worked for them by dividing people into teams who worked in shifts. Their work did not go unnoticed.